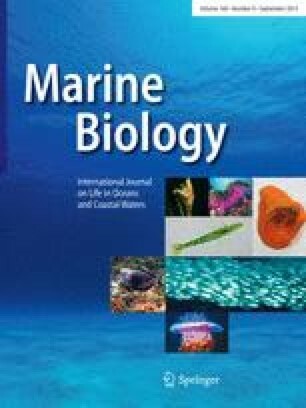 The size-frequency distributions and genetic composition of recruits of the corallivorous snail Drupella cornus (Röding, 1798) were examined in outbreak populations collected from Ningaloo Reef, Western Australia in August 1990. The recruits are found in groups on digitate Acropora spp. corals. Among coral colonies, mean lengths of recruits in our samples ranged from <9 to 22 mm, but the snails within a group were generally similar in size. Despite the fact that D. cornus has planktonic larvae, there were marked genetic differences between groups of recruits on different coral colonies. The relatively large genetic subdivision among groups of recruits within sites over distances <80 m was measured as a value of FST (standardized variance in allelic frequencies) of 0.044. This was three times the value from comparisons of pooled samples of recruits from areas up to 119 km apart, and six times as great at the genetic subdivision among populations of adults over a distance of 180 km. Much of the genetic heterogeneity among groups of recruits is associated with mean size of the snails. Taken together, the size-frequency distributions and the genetic differences indicate that recruits within the same coral colony shared a common history of settlement, suggesting a cohesiveness of groups of larvae. Although the mechanisms for this patchiness are not understood, one implication is that studies of size-frequency distributions and genetic composition of cohorts of D. cornus must treat the group, not the individual snail, as the unit of replication.